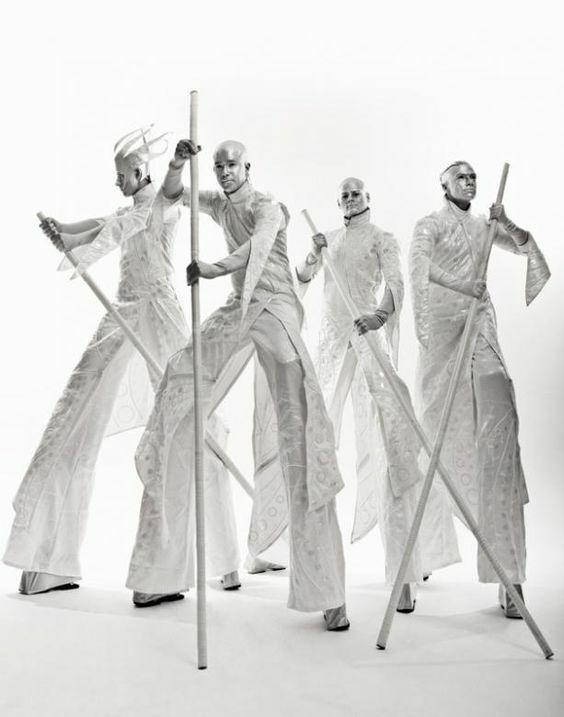 Exquisite stilt-walkers and crystal ball jugglers. 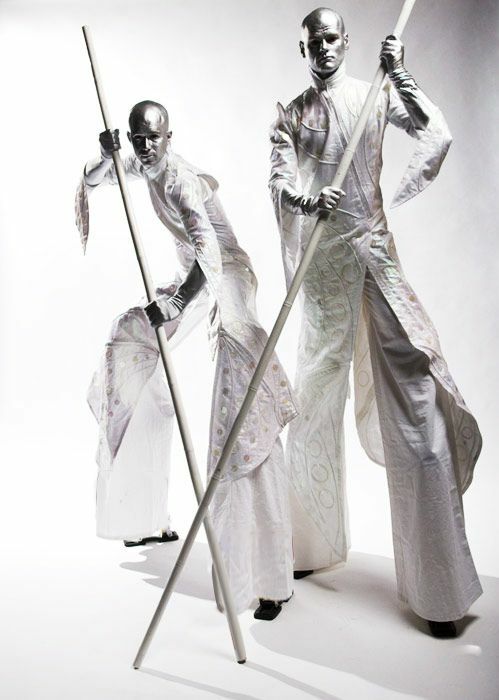 Beautiful and bizarre, four awesome-looking characters in intricate white costume, their entire skulls a brilliant metallic silver. 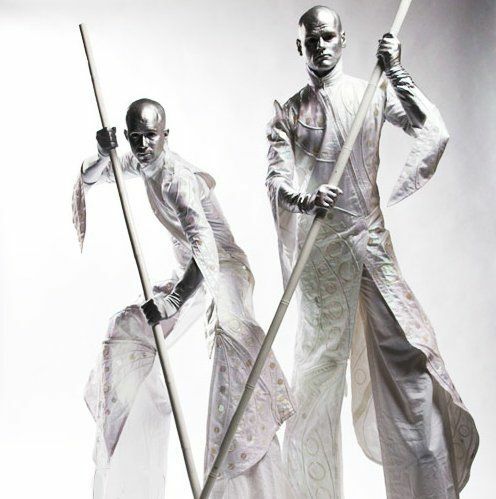 Standing on stilts and viewed high above their audience, Calvos are elegant creatures of a tranquil and mysterious world. 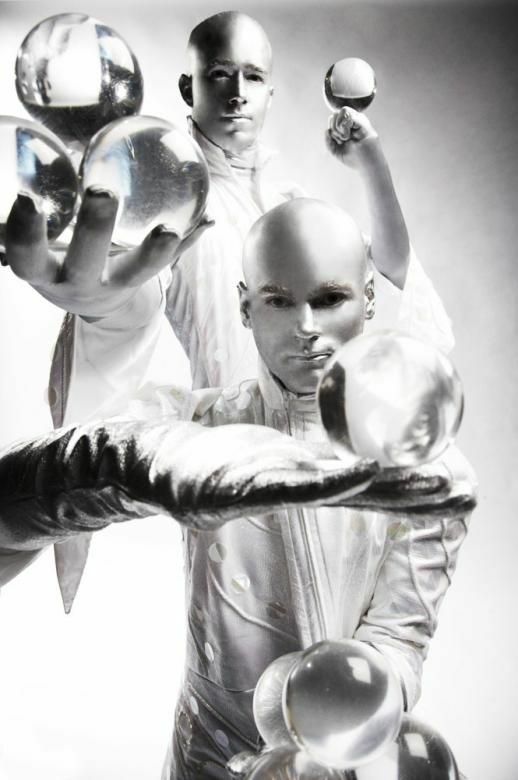 International specialists in the art of ‘contact juggling’, Calvos manipulate crystal balls that glide, float, dance and levitate surreally around their hands, arms and bodies. 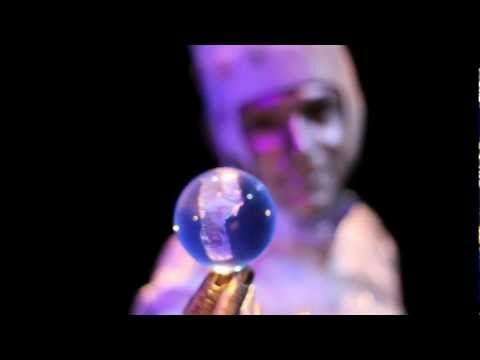 Impossibly skilful, delightfully mesmeric and utterly astounding, this real-live magic must be seen to be believed. 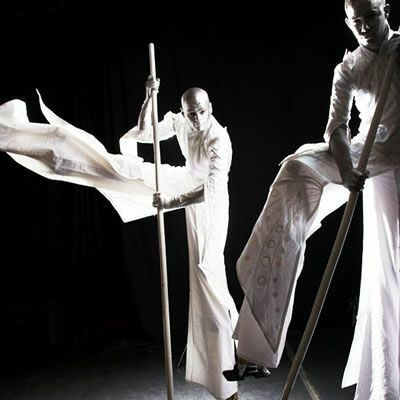 Stunning, spine tingling, elegant and serene, Calvos appear as either ground level crystal ball jugglers or stilt characters – or both – in the same booking. 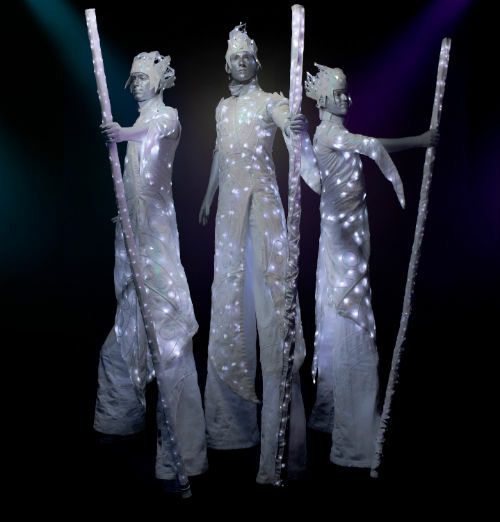 Calvos can perform walkabout, meet and greet and static installations or a mixture of all three! They can be booked as 1, 2 3 or 4 characters performing separately or together. 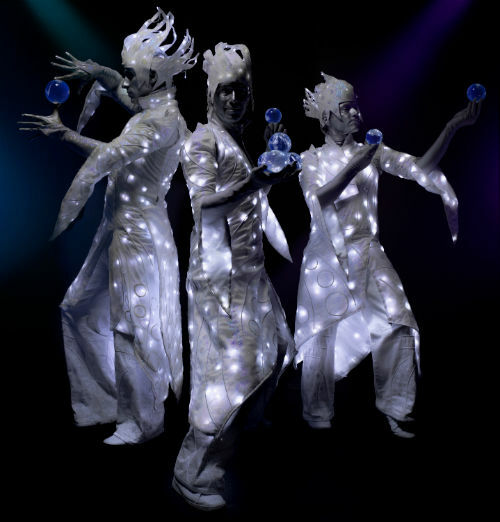 Calvos also perform as walkabout contact jugglers with a range of alternative costumes and characters. 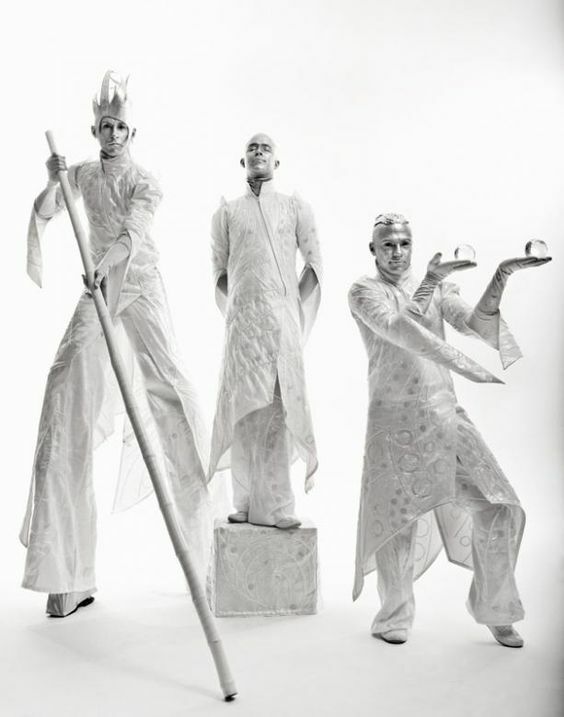 Some of the artists also perform high-skill music choreographed stage routines of approximately 5 minutes in length. 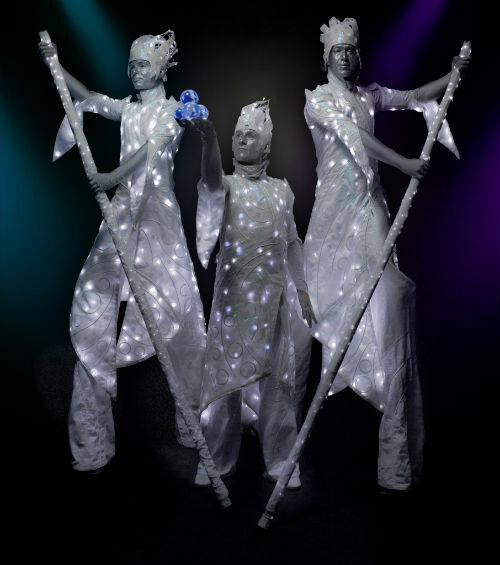 The guys were amazing, went down a storm, and looked fabulous with the event styling and lighting, which was a Swarovski crystal palace! 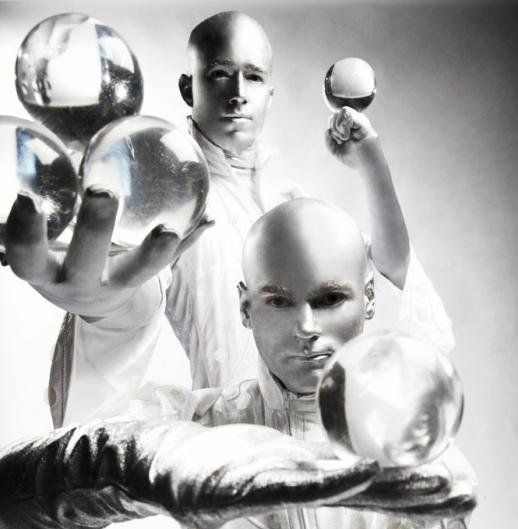 Contact juggling…the art at its apotheosis. The next day feedback was not good, it was FABULOUS and that’s because of you. I think Calvos worked really well as pre-dinner entertainment for the party. It was a beautiful evening so having them outside in the garden was just great. They looked exactly as I had expected and the performance they did matched my expectations as well…so no complaints at all. An almost spiritual experience.” Tarby Davenport “Everybody loved you guys and thought the act was amazing. I still can’t work out how the hell you do that!? They were fantastic. Please pass on my thanks to all of them in particular Jago who went out of his way to adapt their performance around the space at Sketch and timings of the party to maximise the impact. 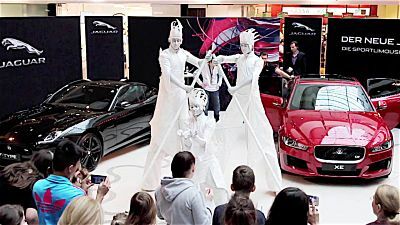 They even managed to perform in an area that we weren’t supposed to use as it made a great entrance experience for the guests. The performers were fantastic! I was so so pleased! They were great to work with, extremely professional and looked brilliant! I look forward to more events together in the future. Yes everything went very well and everyone enjoyed all the acts! Calvos worked very well at the entrance door welcoming the guests and the fire show was amazing (as usual). Calvos were wonderful! Both Stewart and Dimitri were a delight to work with and the crowd really enjoyed them. Unfortunately, the afternoon performance was marred slightly by the horrible weather but the evening went really well and I had lots of positive feedback about both of them. The night was hugely successful and we raised an amazing £40,000!! Thanks for all your help. The evening went down really well thank you. Calvos were really good as a meet and greet and as table entertainment – they had the high impact factor! Thanks for your help. Calvos were great on site. To be honest, things were a bit hectic and it was fantastic that they just came along and got on with the job. Feedback has all been very positive and the client is very happy. Thanks again for everything.